Over vacation we did a whole bunch of cooking in which I loved! Wednesday night I thought it would be fun to cook shrimp and grits (YUM) but we needed a vaggie to go with the meal. We already had a green salad so we wanted something else that wasn't too heavy but would go well with the meal. Maggie suggested that her sister, Jenny, make her creamed spinach. Coming from someone who isn't typically fond of cooked spinach unless it is with artichokes in a dip you serve with chips, I found myself in love with this new dish! Next time you are looking for a veggie side to take to a potluck or just for a meal at home you should try this. It was easy, delicious and the first time in my life I wanted seconds on creamed spinach!! Note from Jenny: Ingredient quantities listed are for 4-6 servings. I usually cook this in a meatloaf dish. The 9x12 casserole dish pictured is 4x the quantities listed. Great dish - whether for a family of 4 or a family of 15!! 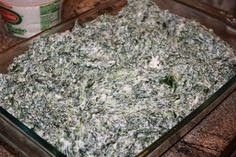 Thaw spinach and drain well. Use a towel to get all of the moisture out of the spinach. Combine cream cheese, Parmesan cheese and spinach and mix thoroughly. Spread into a casserole dish. Bake in oven at 350 degrees until heated through. Top with additional shredded Parmesan cheese if desired. Thanks Ruthie! Ingredient quantities listed are for 4-6 servings. I usually cook this in a meatloaf dish. The 9x12 casserole dish pictured is 4x the quantities listed. Great dish - whether for a family of 4 or a family of 15! !